I don’t know exactly when something becomes a tradition, but we have been making pizzas in our house quite often recently and it has become our Friday night tradition. The weather is cold right now and when Friday afternoon comes along, all I can think about is resting my feet, putting it up and spending time with my husband. Most weeks, Chris is off on Fridays. He is often found diving in the ocean but since the weather and ocean conditions have not been stellar lately, you can find him at home doing boat work and helping getting the baby room ready. (i.e. building a shed in the backyard so we can move our junk from the house to make plenty of room for the baby). My husband loves making bread. He is the bread maker in the family, but he is teaching me and I am slowly learning. You can see a picture of the bread he made from one of my very first post on this blog, back in summer of 2010. 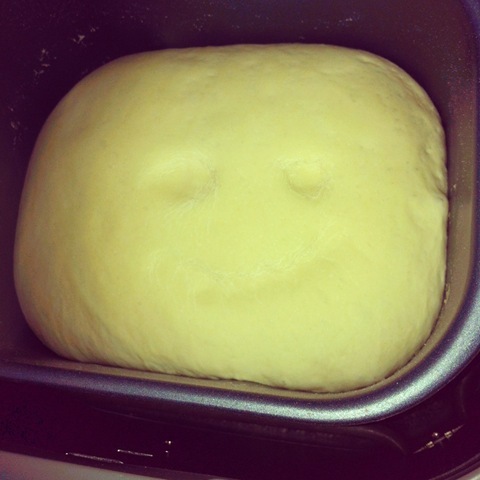 A few weeks ago, he sent a picture of a “happy face” dough rising in the bread maker. It made me extra excited to get home and eat some homemade bread/pizza. This picture made me happy and I love my husband for sending me cute pictures like this that makes me laugh. 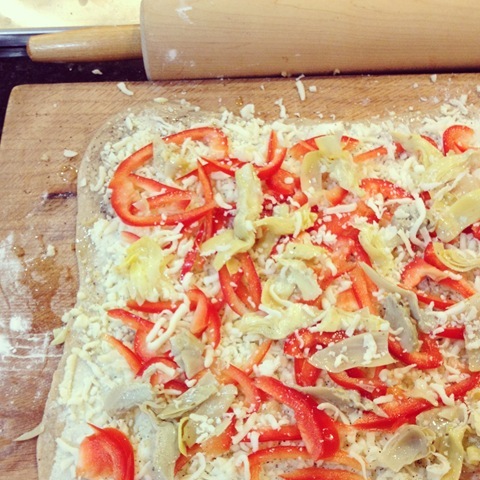 Back to our tradition of making pizzas….my husband loves the basic toppings of cheese and pepperoni. But me on the other hand, I love to find new topping combinations and using different ingredients excites me. 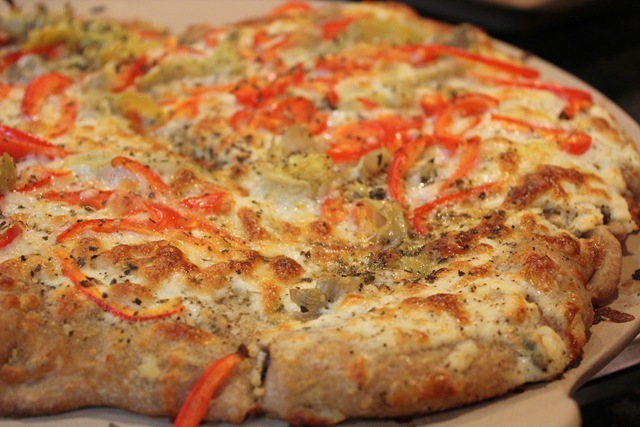 I often find that restaurants offer pizzas and toppings that are popular. 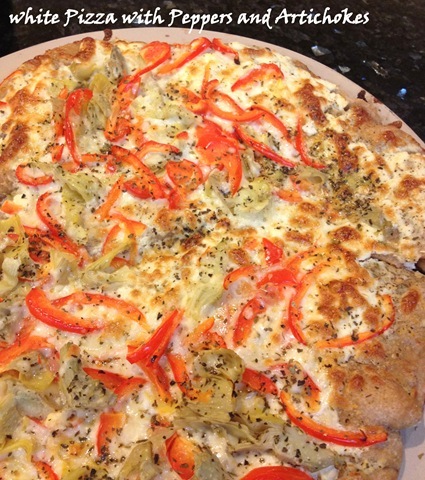 That’s why it’s great to experiment at home, because I can try whatever toppings I want. 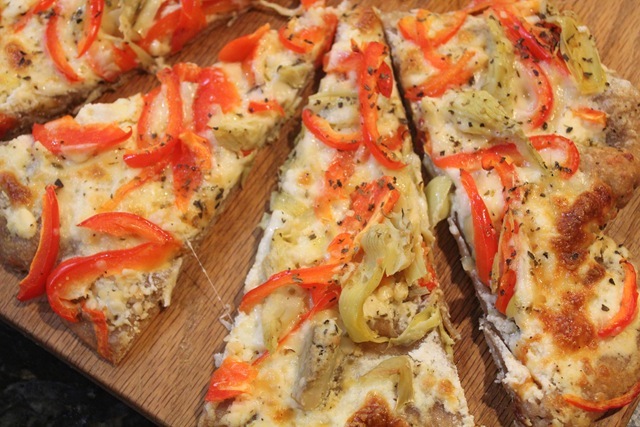 I was inspired by this Mediterranean pizza recipe and adapted it to what I had at home. I wanted to use up ricotta cheese so I added it in the recipe. We rotate the pizza dough that we use, sometimes I buy them pre-made at Trader Joe’s or we make our own dough from the bread maker. I love using a pizza stone when baking pizza. We got ours from Costco. I think it makes a difference in the crust texture. 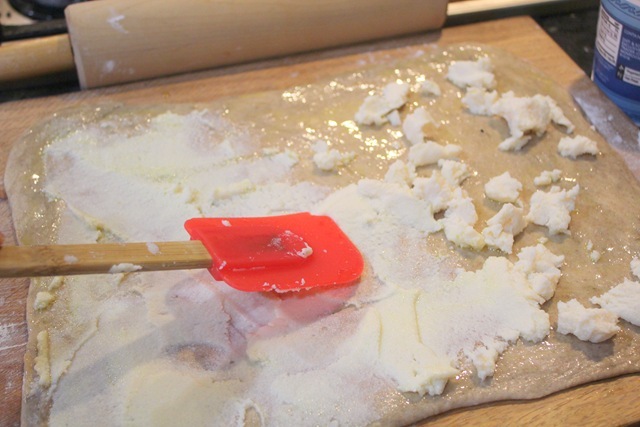 The bottom of the crust becomes crispy while the rest of the dough stays soft and chewy. 1. Preheat pizza stone in oven at 425 degrees. 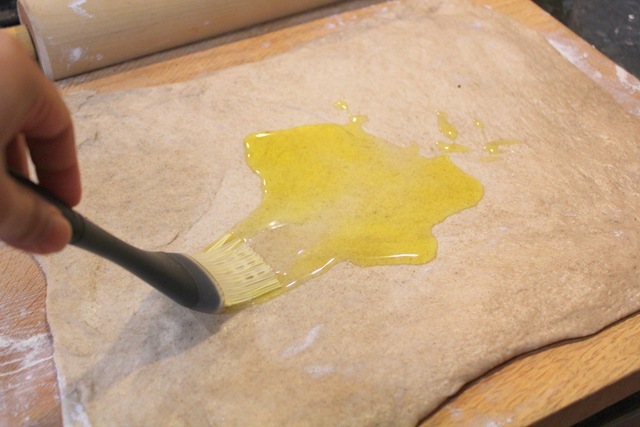 Drizzle olive oil on the pizza crust. Sprinkle the ricotta and spread it on the crust. 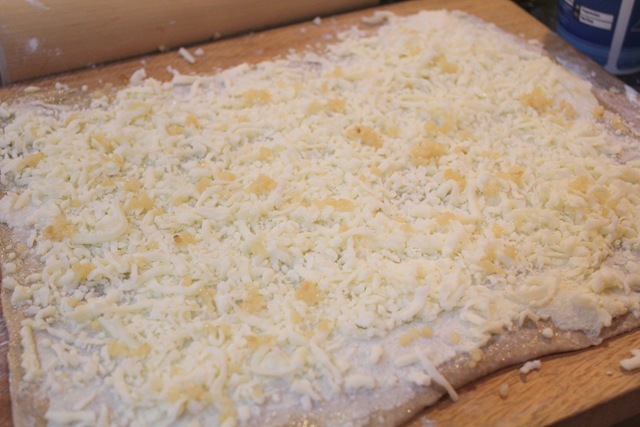 Add mozzarella cheese evenly over pizza crust. Sprinkle with minced garlic and add dash of salt and pepper. 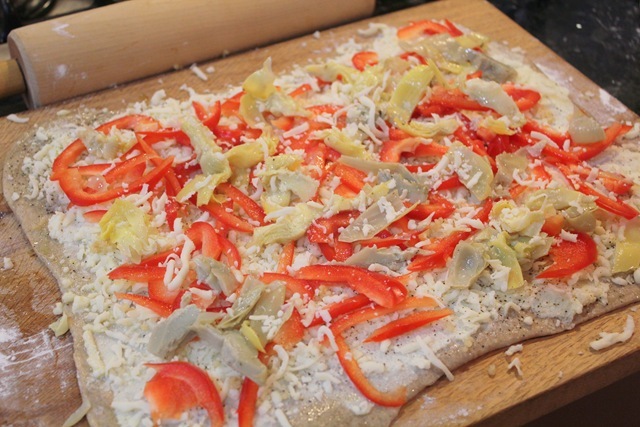 Add pepper slices and quartered artichokes. Sprinkle with seasonings. 2. 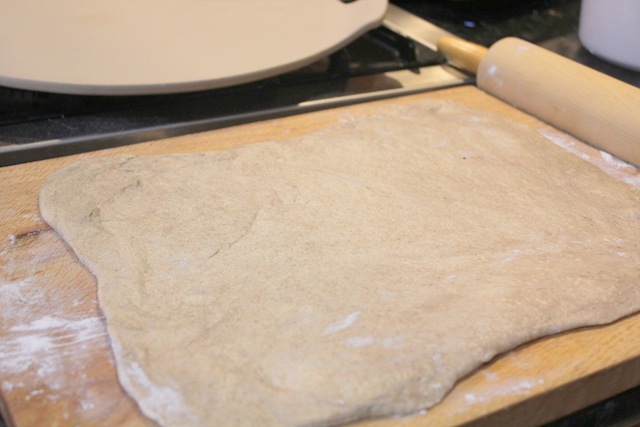 Place on pizza stone dusted with cornmeal. Bake 20-25 minutes, until golden brown.